Late in 1862. 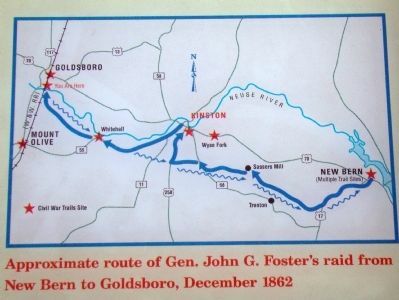 Union Gen. John G. Foster’s garrison was well entrenched in New Bern and made several incursions into the countryside. On December 11, Foster led a raid from New Bern to burn the Wilmington and Weldon Railroad Bridge over the Reuse River at Goldsboro and to demonstrate in support of Gen. Ambrose E. Burnside’s attack at Fredericksburg, Virginia. Foster’s force consisted of 10,000 infantry, 640 cavalry, and 40 cannons. The Wilmington and Weldon Railroad Bridge stood one-half mile to your front, three miles from Goldsboro. Supplies transported by rail from the port at Wilmington had to cross the bridge on the way to the Army of Northern Virginia, making the bridge and the city of Goldsboro vital links in the Confederate supply chain. Foster’s command reached this area on the morning of December 17, after engagements at Kinston and Whitehall. 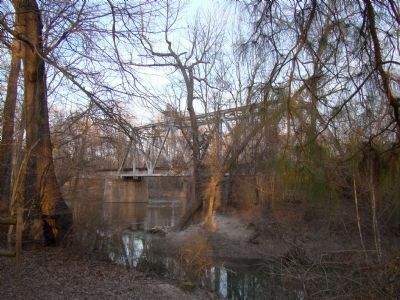 A small Confederate force under Generals Gustavus W.
Smith, Thomas L. Clingman, and Nathan G. Evans defended the bridge. Foster’s men attacked from the other side of the railroad to your right and, after pushing back the Confederates, succeeded in setting the bridge on fire. The Federal artillery then bombarded the burning structure to prevent the Confederates from extinguishing the blaze, while infantrymen destroyed the railroad tracks atop the embankment to your right. Late that afternoon, as Foster marched back to New Bern, Confederate forces crossed these fields and attacked the Federal rear guard on the other side of the railroad to your right, but were repulsed by a heavy fire of small arms and artillery. The Confederates suffered about 150 killed, wounded, and missing during the battle, while Union losses were fewer than 100. The Confederates repaired the bridge within a few weeks. is near Goldsboro, North Carolina, in Wayne County. Marker is on Old Mt. Olive Highway just south of U.S. 117, on the left when traveling south. Touch for map. Marker is in this post office area: Goldsboro NC 27530, United States of America. Touch for directions. Other nearby markers. At least 8 other markers are within 4 miles of this marker, measured as the crow flies. Battle of Goldsborough Bridge (about 300 feet away, measured in a direct line); Confederate Counterattack (about 700 feet away); Attack of the 17th Massachusetts (approx. 0.2 miles away); Union Assault on the Bridge (approx. ¼ mile away); Waynesborough (approx. 2.6 miles away); General Baptist State Convention (approx. 3.2 miles away); Gertrude Weil (approx. 3.4 miles away); First Pentecostal Holiness Church Congregation (approx. 3½ miles away). Touch for a list and map of all markers in Goldsboro. More about this marker. This is Stop No. 1 of the four stops on the battlefield walking tour. 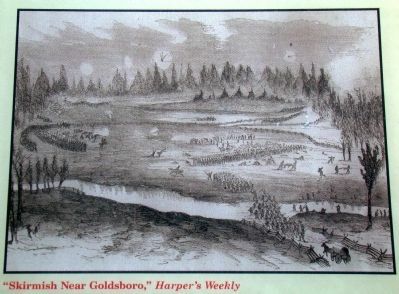 Marker has a Harper’s Weekly illustration of the battle on the lower left; portraits of Generals Foster, Clingman and Evans in the lower center; and two maps on the right side, one of General Foster’s route from New Bern and the other of the engagement here. 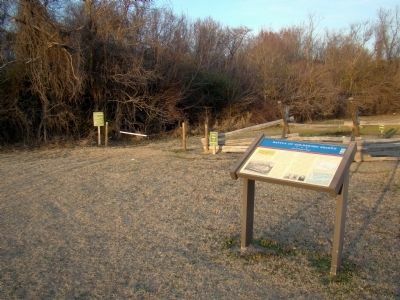 Marker is at the Goldsborough Bridge Battlefield, in the parking area. 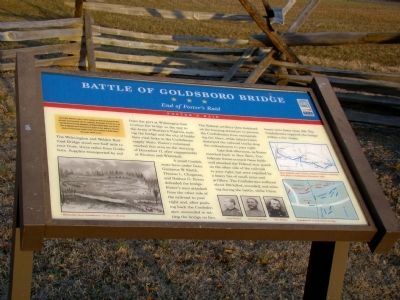 The Goldsborough Bridge Battlefield is owned by Wayne County and developed and operated by the volunteer group the Goldsborough Bridge Battlefield Association. Follow the first link below for more information. The Google satellite view available on the “click for map” link above in the Location Section (then click on the Satellite button in the upper right) provides a detailed view of the battlefield and the current railroad bridge. Portraits of Generals John G. Foster (Union), Thomas L. Clingman and Nathan G. Evans (Confederate). View is from the south bank. This railroad line today belongs to CSX Transportation. From 1900 to 1967 it was part of the Atlantic Coast Line Railroad. More. 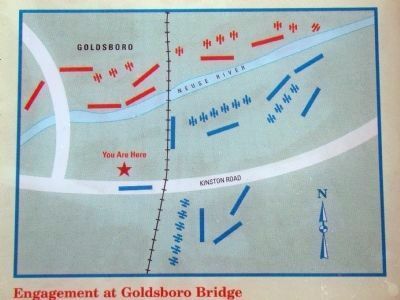 Search the internet for Battle of Goldsboro Bridge. Credits. This page was last revised on June 16, 2016. This page originally submitted on March 7, 2010, by J. J. Prats of Powell, Ohio. This page has been viewed 2,082 times since then and 17 times this year. Photos: 1, 2, 3, 4, 5, 6, 7. submitted on March 7, 2010, by J. J. Prats of Powell, Ohio. • Craig Swain was the editor who published this page.